This lady loves a good bargain. A few years ago, I was inspired by the show Extreme Couponing and went all in. My crazy couponing days are past me, but I still break out the coupons every fall for some thrifty Back to School shopping. As a teacher, I spent money every year on supplies for my classroom – markers, colored pencils, scissors, colored paper, hand sanitizer, pencils, Kleenex, etc. Few of my schools provided these for teachers and students often couldn’t afford them. So, I bought them. However, I couldn’t spend a ton of money on these supplies. I got real good at being thrifty! Looking for a shopping list for your middle or high schooler? Check out my post and download the FREE inventory/ shopping list! Take an inventory of what you already have. You probably already have half of the items you need floating in your house. The backpack from last year still functions. So does the lunch bag. There are definitely pencils, pens, and highlighters left from last year, too. Know what you need to buy and stay laser-focused on that list. Don’t get sucked into buying cute items that you don’t actually need. It helps to do this with your child. That way they will know going into the store what you will buy and what you won’t buy. This takes some time, but it is well worth your money to look at the sales circulars each week. You can snag some major deals by being proactive. If you’re not already couponing, this is a great time to start. Buy the Sunday paper for the coupons. Then check out a couponing site such as Coupon Mom or the Krazy Coupon Lady. They will match coupons to sales at all the major stores. When you combine a sale AND and a coupon, you can save major bucks! There are also several apps that can save you money. Ibotta is a good one to start with. You get money back for your purchases at most major retailers. I also love the Target Cartwheel app. You can combine a sale, Cartwheel discount, AND a paper coupon for major savings. Target also includes discounts on its generic supplies, making them even cheaper. For most school supplies, I am happy with generic products. They work just as well as the name brand supplies, but are much less expensive. My only exceptions – glue and tape. I learned to always buy brand-named tape and glue. Many Dollar Stores, include my favorite Dollar Tree, sell brand-name school supplies. Get glue, pens, or highlighters all for $1. Also, that cuter folder costs just the same, so feel free to grab that! However, I have learned to avoid sticky notes from the dollar store. You know that your kid will need pencils, filler paper, and glue in March. But guess what? Those items will cost WAY more in March. So buy them now when they are on sale. Keep them hidden in a closet, drawer, or back of a kitchen cabinet until they are needed. 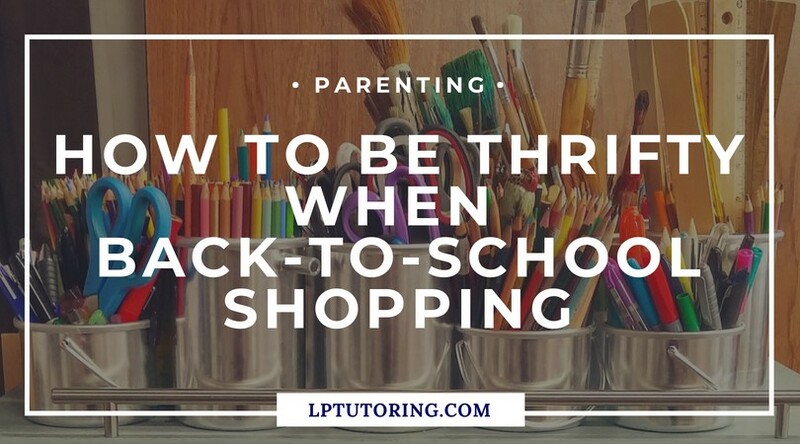 You don’t need to buy every item on the school list. You can definitely make dividers at home with colored paper and index flags or even folded sticky notes. Short on a pencil pouch? Grab a freezer bag and throw those pencils in. You can also make your (inexpensive) plain supplies more stylish. Cover that plain notebook with some washi tape. Heck, I’ve seen students decoupage notebooks before. Don’t underestimate the power of duct tape or craft paper. Don’t forget to grab the shopping list for your teen! 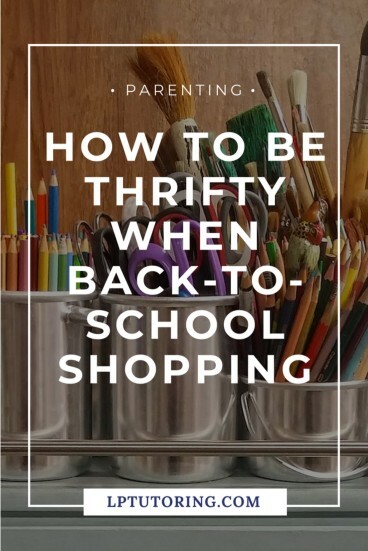 Hopefully, my tips will help you have a thrifty Back to School! One small request – if you have a few extra dollars left, pick up a box of Kleenex or hand sanitizer and give it to your child’s teacher. He or she will truly appreciate it! 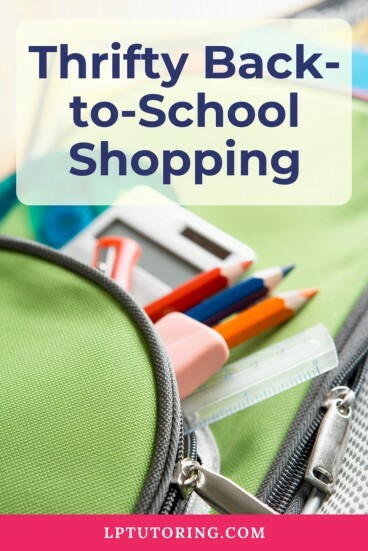 What is your favorite way to save on school supplies? Let me know in the comments below!